MISS NATASHA ENQUIST: ELECTRO-ACCORDION CHANTEUSE: OKTOBERFEST IS HERE AGAIN! This year I joined the Victoria Edelweiss Dance Group, somewhat at the last minute, so I only know one of the dances that will be performed tonight, as well I'll play my accordion along to some of the pre-recorded tracks used for the dance group. This German Club is also home to the Victoria Accordion Club, FYI -- important trivia HELLO!? It really is a guaranteed GOOD TIME! 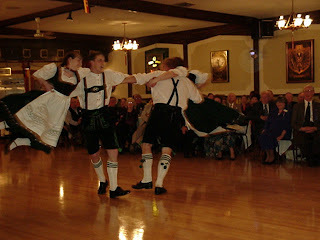 The best German food you can find in town, lots of beer, traditional decor, fun live music, everyone up and dancing -- chicken dance anyone? Prosit!! Oktoberfest at the Victoria Edelweiss Club is happening tonight, Oct 24th, 30th and 31st as well. My gypsy band and I at Madrona Farm's "2nd Annual Island Chef Survival Challenge"
Yes...Gypsies, on a farm, in the morning. We will be herding the crowds in at 11:30am this coming Sunday, October 4th 2009. Join 15 of Victoria's finest chefs up close and personal as they show you just how far they will go to protect the farms that fuel their restaurants. 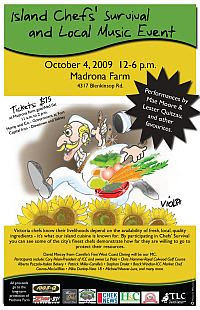 Come discover your new favourite restaurant or watch and learn from some of your favourite chefs as they cook up their magic in the fields of Madrona farm. Each chef arrives on the farm with three bags, utensils, condiments and a piece of meat. Their mission is to retrieve their supplies, find the map of Madrona Farm, battle the obstacles and race to find the food they will use to cook their two masterpieces right before your eyes. Each chef must create 2, 1 plate masterpieces to be auctioned off by world famous chef and mentor David Mincey. Enjoy an afternoon of great food and amazing local music. All proceeds go to protect Madrona Farm forever with the Land Conservancy of BC. For more information, please contact: madrama@telus.net. TICKETS: Tickets are $75, and on sale at Madrona farm stand, Wednesdays to Fridays, 11 a.m. to 2 p.m., Hemp and Co. - Government at Fort, and Capital Iron - Downtown and Sidney.